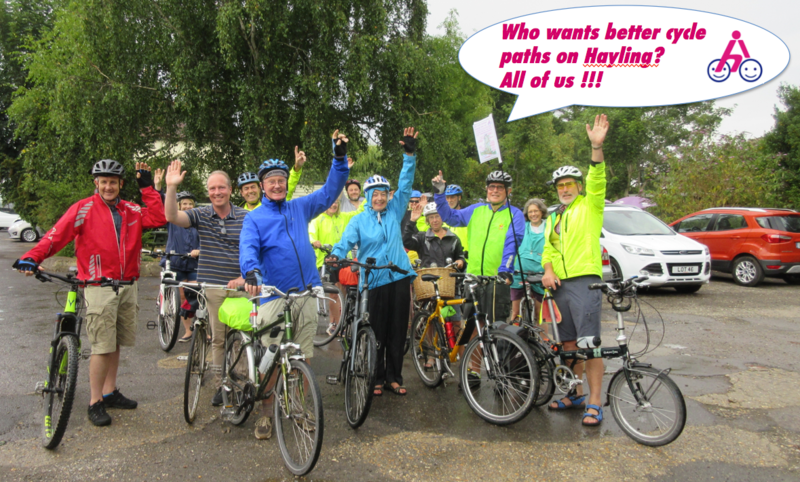 Thanks to all Cycle Hayling supporters who ignored the rain clouds and came out on Friday 27th July for our 2018 ‘Preview’ social ride to preview the Council’s planned cycling improvements, chat about future ones, and celebrate cycling on Hayling. It was great to see everyone, including two of our councillors, and several new riders. We did a near ‘figure of eight’ around the island, with some more great photos here. 18:00: Leave from the Yew Tree Inn towards Northney. 18:10: Visit site of new Northney coastal footpath (tragically only pedestrian width, due to space constraints, but we did try). 18:15: Leave car park at bridge, opposite AppleGreen petrol station: Ride south down Billy Trail. 18:25: Footpath to Denhill Close which we’ve got funding to upgrade for cycling. 18:30: Ride along proposed East/West cycle route – Saltmarsh Lane, Brights Lane, Higworth Lane to St Mary’s Church. 18:35: Ride through Legion Field to see planned new cycle path to Mengham Junior school. 18:45: Ride down Rails Lane, proposed signed quiet route towards Sandy Point via St Hermans Rd. 18:50: Arrive Olive Leaf pub. 19:00: Leave Olive Leaf pub to ride along new beach path to Ferry Boat Inn, possibly via Hayling Park to see planned path widening. 19:20: Arrive Ferry Boat Inn. to toast the new Ferry and chat about the future for cycling on Hayling. They do good food, and probably a fish and chips wagon. 20:30: Disperse for home, with an optional ride up the Billy Trail to Daw Lane and back to Yew Tree Inn. Yours in cycling, Andy, Sue, Robert, Dave, David, Heather, Wilf & Joy.